And although my garden is certainly green, the weeds have taken over, I swear the bags of dirt we bought were bags of instant weed garden, that`s not quite what I mean. First, reducing our electricity usage drastically. We no longer watch as much tv. I`ve used the dryer for about a total of 1 hour in the last week, instead of about 7 or 8 (loads never take just an hour to dry!). 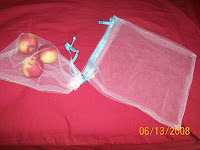 And, after seeing sellers on Etsy selling reusable produce bags, I thought I would make some for me. I will not be selling these bags on Etsy, as there are already several sellers there...check them out if you`re looking to buy! I figure if I use them, I`ll have cards ready for people who notice and ask where on earth I bought them. Just think of how many plastic produce bags you use a week: a few potatos, one bag. A few apples, another. Lettuce, another. Grapes, another. Peppers, another...and on and on. The more fruits and veggies, the more bags. And where do they go...the dump. Multiply one week by 52...wow. And multiply that by (insert number choice here) people shopping...double wow. Then, think of how many bags that would NOT go in the dump. Some countries have already outlawed these bags. They blow around, clog the sewer drains, water backs up, stagnates...you get the picture. So, I`m kinda excited about these bags. And hey, if a few people ask me to make some, my sewing machine really did enjoy getting a bit of a work out yesterday so I`m sure it will enjoy more. Not to mention a little extra cash would be nice.